LPG or cooking gas prices have been lowered this month, reversing a rising trend in the past six months. While the reduction in subsidised LPG is to the tune of Rs. 6.51-6.58 per cylinder (14.2 kilograms), the cut in non-subsidised rates stands at Rs. 133-134.5 per cylinder in Delhi, Kolkata, Mumbai and Chennai, according to Indian Oil Corporation’s website. The country’s largest fuel retailer Indian Oil – the supplier of LPG under brand Indane – had increased the price of subsidised LPG by Rs. 14.13 per cylinder in the national capital from June to November. 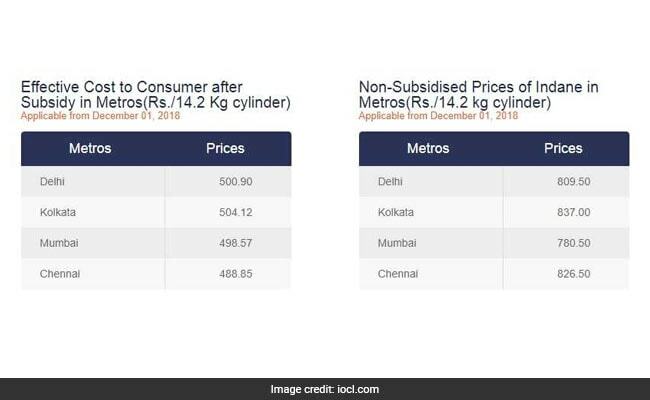 After the latest revision, subsidised LPG rates stand at Rs. 500.90 per cylinder in Delhi, Rs. 504.12 per cylinder in Kolkata, Rs. 498.57 per cylinder in Mumbai and Rs. 488.85 per cylinder in Chennai, according to Indian Oil. Non-subsidised LPG prices are at Rs. 809.50, Rs. 837.00, Rs. 780.50 and Rs. 826.50 per cylinder in the metros respectively. Announcing the price revision in its statement on November 30, Indian Oil had said the effective price after subsidy to consumer would reduce by Rs. 6.52 per cylinder (from Rs.507.42 in November 2018 to Rs.500.90 in December 2018). “The reduction is on account of GST impact on decrease in price of Non-Subsidised LPG,” the fuel retailer had said. The government subsidises 12 LPG cylinders of 14.2 kilograms each per household in a year. It provides the subsidy amount directly in the consumer’s bank account. The consumer has to bear the market price for additional LPG cylinders in a year. This subsidy amount varies from month to month depending on the changes in the average international benchmark LPG and foreign exchange rates. Are you a member of the EPF? If you are, you’re in luck!